Well, it definitely took me a little longer to read the second half of my two book challenge. The book has been an amazing read, but it suffers from being a non-fiction type of up hill battle in the reading department. If you put in the effort, I promise you will come out the other side with an amazing reading experience. This look into one of the founding father's of federal reserve land that managed to preserve some of the final pristine landscapes of the Wild West, now recognized as some of the most visited National Parks, is absolutely amazing. I have always loved biology and geography subjects in school, yet somehow I had never been made aware of the impact John Muir had on the natural sciences. He was an intriguing blend of Ralph Waldo Emerson and Nikola Tesla. The man made astonishing inventions that forwarded industry while travelling the continent searching for the beauty of God in nature. He had a hard life and still managed to just appreciate the beauty. Amazing. The duality of his nature pulses with the very nature of modern society. There are large pushes in the technologies to make our lives distanced from the natural evolution process in medicine and manufacturing at the same time that major movements for a greener living with little impact on the environment are taking root. 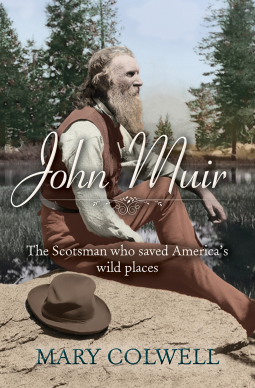 I really cannot express the brilliance Mary Colwell has brought to John Muir's life in a mere book review. I have gone from never knowing the name John Muir to finding the beauty in my own surroundings. His light and spirituality has seriously made me look inside myself and my living decisions, which would not have been so vibrant of a search without the elegance of Mary Colwell's research. Her enthusiasm for the man and sharing his legacy have added to the sheer brilliance of an American hero and icon. This immigrant was why our country was founded, and his life can be a present reminder about seeing God in everything and everyone. I supremely recommend this book to everyone. It can be a long read and might even need some extra mental fortitude to push through, but it is well worth the uplift it will give to your soul. 5 stars. No question.